Next Sunday is the big day for all the children who have been waiting to clamber aboard a gigantic reclining sculpture that settled into a grassy patch of Aspinwall Riverfront Park nearly a year ago. “They see it through the trees, and they just shriek with joy,” said Susan Crookston, an Aspinwall resident and driving force behind the change of destiny for riverfront property that was slated to become a parking lot. A free public celebratory opening will be held from 11 a.m. to 1 p.m. next Sunday to mark the completion of construction and landscaping on the 11-acre property that includes walking trails and a small amphitheater that doubles as a sledding hill in the winter. 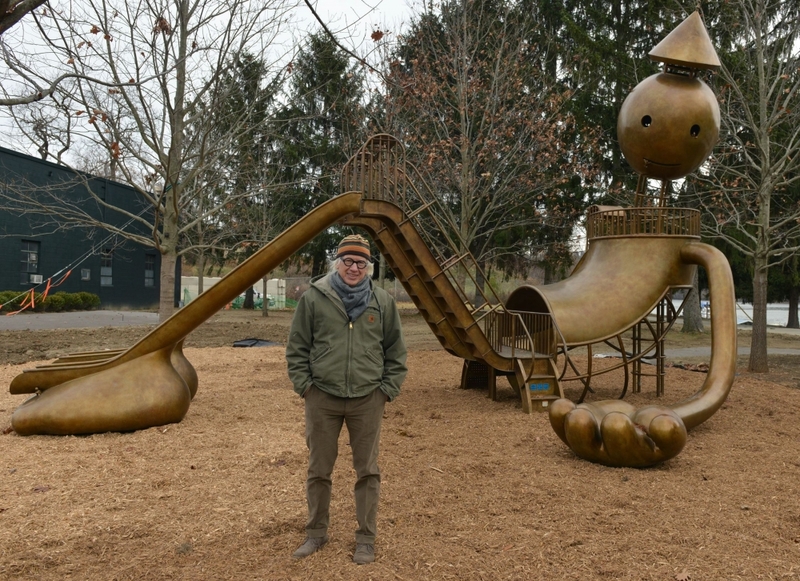 But the draw for children — and for cultural tourists from within and outside the region — is “Playground,” a 30-by-30-by-24-foot bronze sculpture by New York artist Tom Otterness. The main figure incorporates a slide and nooks to explore, some of which are populated by smaller figures that exude the same delight of discovery as their little human counterparts. The sculptor doesn’t like to put sculpture on a pedestal. Mr. Otterness’ “Other Worlds,” also a sculpture that invites playful interaction, debuted last year at Hamad International Airport in Doha, Qatar. Mr. Otterness’ figures are structured upon basic sculptural shapes like cubes, spheres and cones, and generally not embellished, in order to reflect a universality and, to a degree, timelessness. In a bow to Hamad’s international status, he varied the little figures. Some were dressed in Middle Eastern garb, others as cowboys or wearing German lederhosen. There are 20 to 30 little figures on each of the “Playground” series sculptures, and he places them differently on each one. They’re added at the end of the casting, at the foundry. The artist walks around the large work, noting where eye contact is made and placing a surprise there. It was hoped that the artist would return for next Sunday’s celebration, but he’s working day and night, he said, on his contribution to an exhibition, “The Value of Food,” which opens next month at The Cathedral Church of Saint John the Divine in Manhattan. “How often do you get a chance to work in [the equivalent of] a medieval cathedral?” he said. He’s creating new work that will be displayed in niches within the Episcopal church. Mr. Otterness will also exhibit silver point drawings in “Tom Otterness: Metal on Paper,” opening Wednesday at Marlborough Gallery in New York. “Playground” was purchased by The Grable Foundation and is on long-term loan to the park, an arrangement that essentially means that the foundation will handle maintenance of the artwork, which is valued in excess of $1 million. Site preparation by the foundation included a nine-page shade analysis made before selecting the 25- to 30-foot-high 2,000-pound oak trees that will keep the bronze work cool in the summer sun. Aspinwall Riverfront Park is not a municipal park and is open to everyone, Ms. Crookston said. This is the first stage of park development, which will now turn to river access and a welcome pavilion with running water and restrooms. In the initial planning stage, 1,800 local residents were asked what they most wanted in the park. Trails, nature and a playground were the first three preferences. Initially, $2.3 million was raised through grass-roots efforts to acquire the property. Fundraising continues for the next stages of development and to establish a $2 million endowment. So, far $1.15 million has been raised for that. “Playground” is “a special piece, and I’m really thrilled to have it. It’s kind of a benevolent presence in the park,” Ms. Crookston said. The celebration will kick off at 10:45 a.m. Sunday at the lower Aspinwall ballfield with a bagpipe parade led by 14-year-old volunteer Glenna VanDyke. Visitors are advised to walk from the ballfield with the parade as parking is limited at the park, which is at 285 River Ave., Aspinwall (15215). The opening will feature a ribbon-cutting ceremony, music, food trucks and face painting. A specially designed T-shirt will be sold for $10. Post-Gazette art critic Mary Thomas: mthomas@post-gazette.com or 412-263-1925.